This article is about the U.S. state. For the river, see Mississippi River. For other uses, see Mississippi (disambiguation). 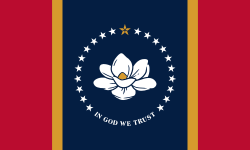 "The Magnolia State", "The Hospitality State"
Mississippi is one of the states of the United States. Its capital and largest city is Jackson. The state flower and tree are the magnolia. Other large cities are Biloxi, Greenville, Gulfport, Hattiesburg, Meridian, Pascagoula, Southaven, Tupelo, Starkville, and Vicksburg. It touches Arkansas (by the Mississippi River), Louisiana, Tennessee, and Alabama. 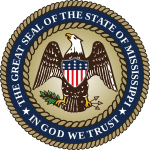 Wikimedia Commons has media related to Mississippi. ↑ "Mississippi: Population estimates". U.S. Census Bureau. July 1, 2017. Retrieved May 6, 2017. This page was last changed on 25 January 2019, at 22:17.